The goitered or black-tailed gazelle (Gazella subgutturosa) is a gazelle found in Georgia, Azerbaijan, Iran, parts of Iraq and Pakistan, Afghanistan, Tajikistan, Kyrgyzstan, Uzbekistan, India, Turkmenistan, Kazakhstan and in northwest China and Mongolia. The specific name, meaning "full below the throat", refers to the male having an enlargement of the neck and throat during the mating season. 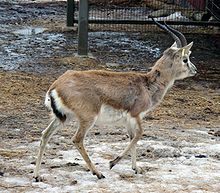 The goitered gazelle inhabits sands and gravel plains and limestone plateau. Large herds were also present in the Near East. Some 6,000 years ago, they were captured and killed with the help of desert kites. Rock art found in Jordan suggests ritual slaughter. 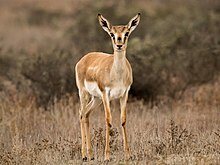 It runs at high speed, without the leaping, bounding gait seen in other gazelle species. Throughout much of their range, goitered gazelles migrate seasonally. Herds cover 10–30 km per day in the winter, with these distances being reduced to about 1–3 km in summer. Their mating behavior is polygynous and usually occurs in the early winter. Several subspecies have been described. Groves & Leslie (2011) distinguish four forms, which they treat as separate monotypic species. Wacher et al. established that G. s. marica is a separate species, Gazella marica. It is listed as an endangered species in Pakistan. The Arabian sand gazelle (Gazella marica) occurs in Saudi Arabia, southern Syria, southwestern Iraq, United Arab Emirates, Oman, offshore Persian Gulf islands. Until recently, goitered gazelles were considered to represent a single, albeit polymorphic, species. However, recent genetic studies show one of the subspecies, G. s. marica, is paraphyletic in respect to the other populations of goitered gazelles, although gene introgression is observed in the contact zone between the two species. ^ a b c d Mallon, D.P. (2008). "Gazella subgutturosa". IUCN Red List of Threatened Species. Version 2008. International Union for Conservation of Nature. Retrieved 18 August 2015. ^ a b Amos, Jonathan (19 April 2011). "Gazelles caught in ancient Syrian 'killing zones'". BBC News. Retrieved 19 April 2011. ^ Role of mass-kill hunting strategies in the extirpation of Persian gazelle (Gazella subgutturosa) in the northern Levant. Guy Bar-Oz, Melinda Zeder, and Frank Hole. Proceedings of the National Academy of Sciences, 2010. ^ Xia, Canjun, et al. "The energy-maintenance strategy of goitered gazelles Gazella subgutturosa during rut." Behavioural processes 103 (2014): 5-8. Wikimedia Commons has media related to Gazella subgutturosa. This page was last edited on 17 April 2019, at 05:58 (UTC).